A Man Cave is a space that is basically a sanctuary where a man can do as he pleases. Normally, the wife has the say or the authority over the house in terms of decorating and designing (come on guys, you know that is true). But in the Man Cave, the man does not have to worry about bothering their significant female other or clashing with any of the other decor in the house. It can be in the basement, garage, or whatever space in the house is available but one thing is for sure…he owns that space and he can act like a caveman in it if he chooses. 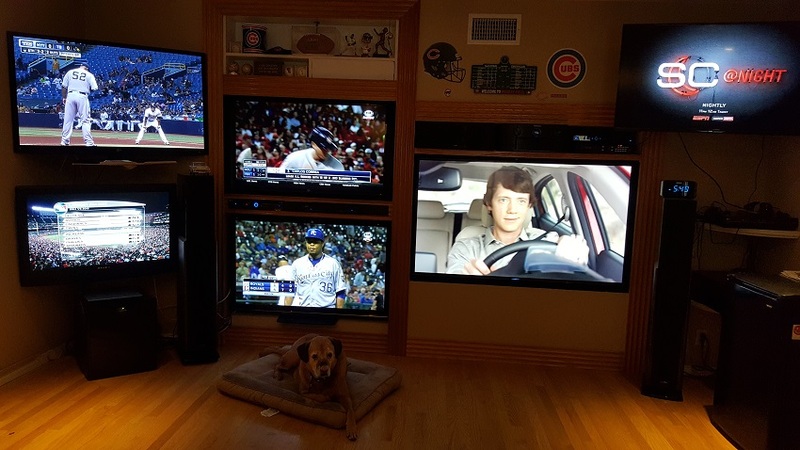 My husband is a huge sports fanatic and whenever he is home you can find him in his Man Cave in a trance in front of one of his SIX, yes count them, SIX TVs. It is like he is hypnotized. His major loves are baseball (Cubs), basketball (Bulls) and football (da Bears – good luck with that), but you can find him watching about just anything. In the rare occasion that one of his favorite sports are not on, I have seen him sitting in a trance watching the very exciting sport of lawn bowling. Not that there is anything wrong with that. Technology is almost always the major player in any man cave. 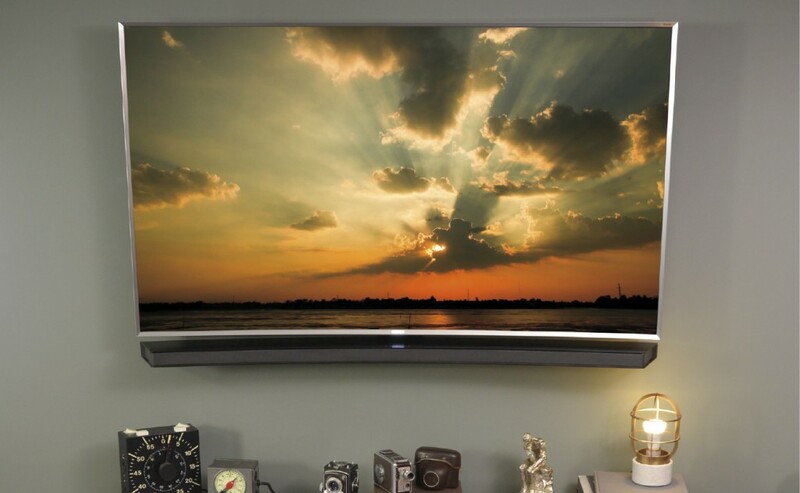 Best Buy is all about technology so to show off what’s possible when setting up your man cave, they took a tired, old basement and turned it into something a little more “man-tastic.” When it comes to man cave essentials, a big TV is a must have. Some Man Caves, like my husbands, have limited space and viewing a large TV can be tricky. Get too close and the picture starts to get all pixelated. With 4K Ultra HD TVs, the standard viewing distance rules no longer apply. Best Buy went with a curved 4K Ultra HD TV with a curved soundbar to match in their Man Cave. My husband also purchased the 4K Ultra HD TV last March from Best Buy and he is as happy as a lifelong Cubs fan could be this time of year. Take a look at his Man Cave below. If TVs and sports are not necessarily your thing, Best Buy has a lot of other great ideas also for The Ultimate Man Cave. You can find out how to build a PC Gaming Station, add a Smart Putting Green, have your own Robot Fight Club, set up a Sports Alert Light Show and customize a Kegerator with a 3D-Printed Tap. Make sure you click on this link and check out all of Best Buy’s awesome ideas and product information so that your man can have the Man Cave that he so rightfully deserves. P.S. I do spend as much time in my husband’s Man Cave as he does and I especially love spending time there when the Packers take care of the Bears twice a year. 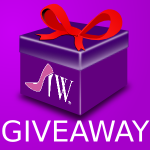 ReTweet the tweet below to help spread the word! Best Buy always has a great selection of electronics which are certainly a must-have for any man cave! I can’t get over that man cave with all the tv monitors. Incredible! My husband was just saying we needed a bigger television in our living room. He wants it for football, I want it for the housewives! I wish he had a Man Cave. I can’t let my husband see this, lol. He already has a big tv installed in his man cave. If he sees this, he’ll never stop until he gets it. That’s on my Christmas wish list. I want a curved TV but was waiting for them to work out all the kinks before I got one. Will have to check out Best Buy and view them up close when it’s time to buy though. My husband could have a field day in man cave supplies if he had a million dollar gift card to Best Buy. They have just about everything they need for football season. My husband has been talking about turning the den into a Man Cave. Best Buy will be the first store he visits. He has been talking about a surround sound system. Ok, my husband would go into this man cave and never come out! This TV is phenomenal! Best Buy has a ton of cool tech. I have been wanting one of those curved TVs. 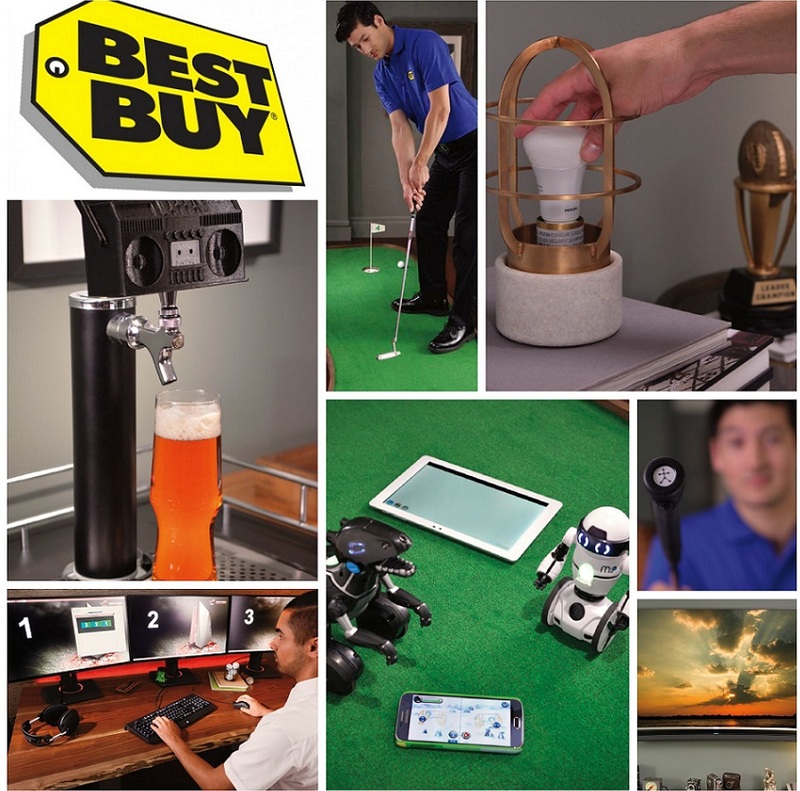 It would be so cool to build a proper man cave with Best Buy’s ideas. They have some ones I never thought of. My husband has grand plans for our unfinished basement. He already did up my 1/2 into a nice craft/laundry room. Now he’s excited to start on his “Man Cave”! Wow those are great choices! My husband would love to have a man cave with all these great gadgets in it! What guy wouldn’t love this stuff! I have a woman cave in my basement and it’s a great space! My husband is hoping for a Man Cave in our next home. I showed him these pictures and his eyes lit up! Best Buy knows what men want and this is spot on! They definitely have some sweet ideas! My boyfriend would love all the techie stuff. My husband would love a man cave. Sadly we don’t have the room but if we did we’d for sure fill it with goodies from Best Buy! I CANNOT show this to my husband. He would be at Best Buy today getting that TV. Seems our 42″ us just too small. Maybe, just maybe I will let him talk me into it at Christmas. My husband has taken over a corner of our basement as his man cave. He has quite the wishlist from Best Buy to furnish it – starting with a huge tv. Col man cave. hubby had turned our bedroom into his man cave for sure. I keep pondering about getting a new TV so forget the man cave – I want a Sarah cave! My husband would love this man cave! Wow it is amazing! He is a HUGE Packers fan too LOL! Your hubby’s man cave reminds me of my husband’s friends house. He has a room with a TV’s set up similar to the one you pictured so that he can watch all of the football games that are on. I’m sure my husband’s “man cave” will look like that someday, lol! Wow! I don’t think I’ve ever seen six TV’s in one room before! My husband wants to be friends with your husband. lol I love those little robots – how cute!! I want my own man cave! 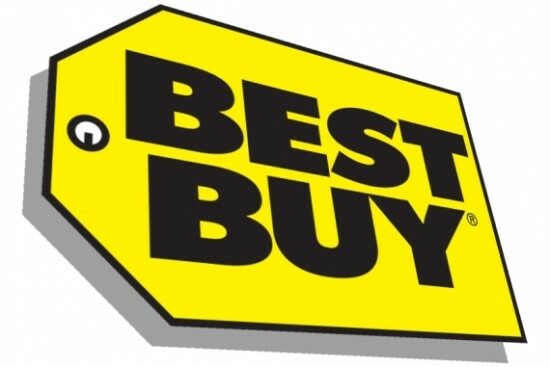 Best buy is the best for quality stuff at competitive prices! This is exactly the kind of stuff that men like. It’s perfect for filling their “cave” up with. The 4K Ultra HD TV is a must have, it is so beautiful. My dad would surely love to watch all the upcoming football games on that Tv. I wish we had room in our house to make a man cave and a woman cave as well. Best Buy is my go to place for all thing electronics. 6 TV’s? Probably all on at the same time. I can guarantee I would never go into that man cave!! But if that is what makes him happy–so be it! Best Buy has all the necessary items to make a legendary Man Cave. I might have to take it over! These are awesome! Sometimes I wanna try to buy at best buy.